Enhance your yard with these durable and versatile ratcheting anvil pruners. With a 1" cutting capacity these can handle most jobs with ease. Aluminum alloy means there will be years of use before you see wear and tear. A must have for any professional landscaper or home gardener. 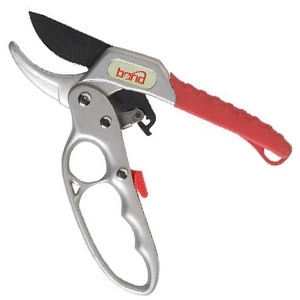 Bond Deluxe Ratchet Anvil Pruner features: patented aluminum alloy construction, a knuckle guard for safety and consumer friendly "Touch & Try" packaging. 1" cutting capacity and a 10 year warranty.